Accidentally deleting photos or formatting a camera’s memory cards/memory sticks without having a backup can be a truly painful experience. You will feel very frustrated when this happens especially if the deleted photos are important or meaningful to you. In the event that this happens, for Mac users only, the free photo recovery program, Exif Untrasher, can probably help you recover your loss and give you some hope if you are lucky. 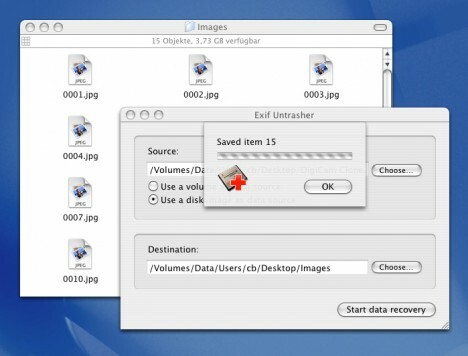 Exif Untrasher is a free app for the Mac which can help careless users to recover accidentally deleted images from digital cameras’ memory cards or memory sticks. This app supports most of the media card types, e.g. SD, memory stick, CompactFlash, etc. To do the recovery work, users just need to plug the memory card into their Mac, run the program and check whether the Mac detects it as a mounted volume. Once it is done, select a destination folder for the recovered images and Exif Untrasher will start doing the recovery work. The major drawback for this application is it only recovers images in JPG format. If your camera saves the images in other formats or contains other files such as video files, then it is too bad for you. This app may save you a lot of trouble and it is free. Download Exif Untrasher via the link here.